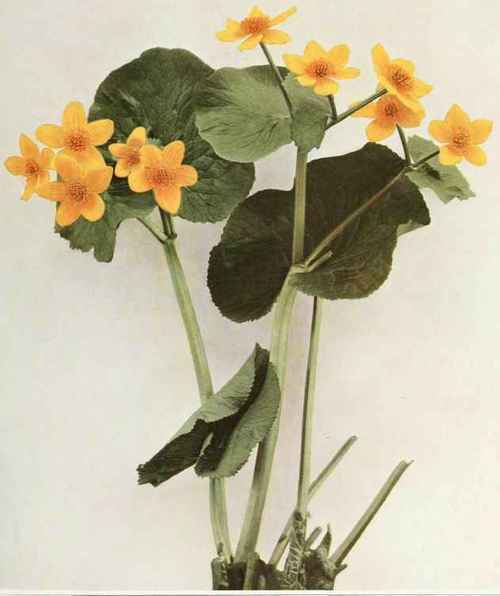 A succulent, herbaceous plant with stout, glabrous, hollow stems, erect or ascending, 1 to 2 feet high, branching and bearing several or numerous bright-yellow flowers. Lower leaves long petioled, the blades cordate or reniform, 2 to 8 inches broad, with a narrow sinus, crenate, dentate, or nearly entire on the margin. Upper leaves smaller, with short petioles or sessile with nearly truncate bases. Flowers 1 to 1½ inches broad; sepals oval, obtuse, petallike. True petals none. Stamens numerous, obovoid. Carpels several, in fruit forming follicles which are slightly compressed, about one-half of an inch long, and slightly curved outward. In swamps, wet meadows and marshes, Newfoundland to South Carolina, west to Saskatchewan and Nebraska. Flowering in May and June.